A Rose for Emily is a story with a quite gloomy plot. The plot line followed readers through three deaths. This work of Nobel laureate William Faulkner is a common subject for studying in schools and colleges. 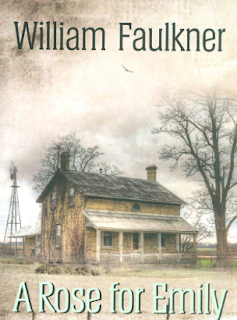 It is considered that the author conveys to readers the atmosphere of the old South of the USA. The beginning of the story was about the death of Emily, who was an old lady, who had lived in the city all her life. "When Miss Emily Grierson died, our whole town went to her funeral: the men through a sort of respectful affection for a fallen monument, the women mostly out of curiosity to see the inside of her house, which no one save an old manservant—a combined gardener and cook—had seen in at least ten years." Following parts of the story were about her life. Her father was a rich and respectable citizen of the city. Young Emily lived with him, their circle acquaintance was quite restricted. When her father died, Emily couldn't accept this fact saying everybody that he is alive. The body of her father was taken from the house to cemetery despite her wishes. Following time she refused of any contacts with inhabitants of the city when they asked her to pay the taxes, she denied doing it referring to the conversation with Colonel Sartoris who died many years ago. The second part of the story was about another time: "That was two years after her father's death and a short time after her sweetheart—the one we believed would marry her ... people hardly saw her at all." Only her servant was going in and out with a market basket. “Just as if a man—any man—could keep a kitchen properly,” the ladies said; so they were not surprised when the smell developed.". Dwellers complained about it to the judge, but he said it wouldn't be necessary. After two weeks the smell went away. Part three was about the time when Emily was a young lady a year after her father died. The young man - Homer Barron came to the city. He was good in communication, soon he knew everybody in the city. The public was surprised when they said Emily with Homer driving in the yellow-wheeled buggy. Emily looked like an extravagant lady: she didn't communicate with people of high society, once she was noticed buying a poison in the shop. When Homer disappeared, she stopped leaving her house at all. The relatives of Emily came to the house when she was buried. They had to break the door in a closed room above stairs in the house. They saw there a skeleton of a man lying in the bed. They "noticed that in the second pillow was the indentation of a head ...", they "saw a long strand of iron-gray hair." This story is scary and intriguing. It is interesting to explore the method how William Faulkner was able to keep suspense during of all story. He used the sequence of the chapters so, that events were described not in a chronological order but for the purpose to hide for readers the climax of the story and reveal it in the last lines. The story inspired many people for writing essays, creating video interpretations and so on. We can find these works on the Internet and on Youtube.